THE REVO has the largest shelves and best shelf-to-shelf spacing of any freeze dryer in its class offering up to 10 sq ft of shelf area and a condensing rate of 20 Liters in 24 hours. This allows for more product throughput in the same floor space. Using the best components and design techniques combined with the most advanced PC/PLC control system, the REVO offers data collection and self-testing features. Overall, THE REVO is the perfect solution for both your protocol development and small scale production needs. 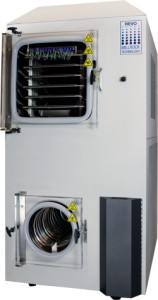 Our easy-to-use software provides automatic freeze-drying, defrost, system and leak rate testing. Data can be printed either numerically or graphically. This same control system is used on industrial dryers, allowing scaling to production. An interactive maintenance screen simplifies component servicing. All systems are remotely accessible, with customer approval, for trouble-shooting process issues. 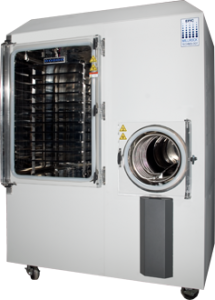 THE REVO has been developed from over 50 years of experience in the freeze drying world. The standard system design provides a highly reliable platform for your freeze drying needs. Using more robust refrigeration components ensures the highest performance and reliability available. In addition, the system is designed to be more tolerant of fluctuations in room temperature and supply voltage, which are common issues with lower end systems. 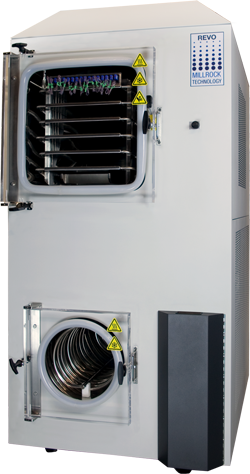 Unique design with features include: more accurate vacuum sensors; no rubber hoses; no vapor flow choke points; superior shelf temperature uniformity; reduced shelf temperature transition times; increased stoppering pressure; and more, to ensure that the equipment is not a limit to your freeze drying needs.